Hi everyone and welcome to the Clique Kits July Honor Society blog hop! You should be arrving here from Mariah's blog. Along the hop you'll find all kind of fun projects made by the Clique Kits members. Be sure to make a stop at every blog for your chance to win the giveaway! The challenge this time is Captured on Film. 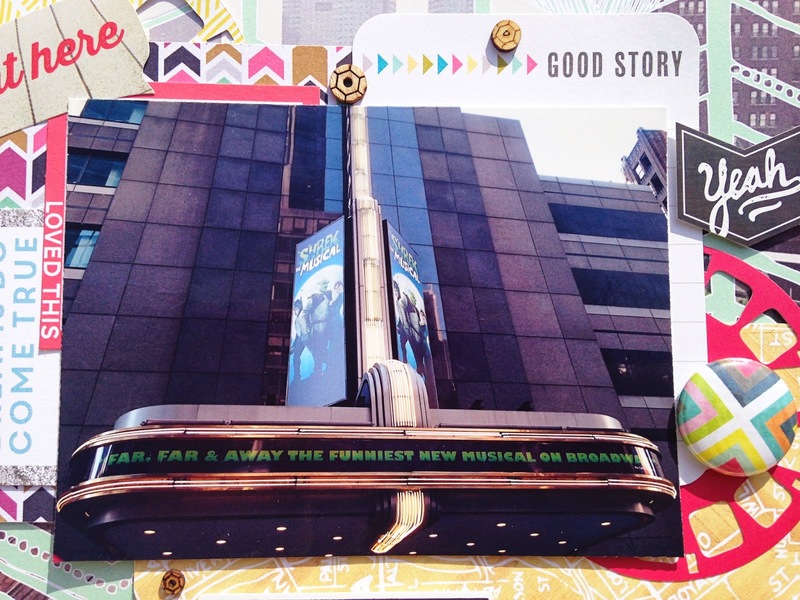 Ideas for projects are using filmstrips, viewfinders or polaroids on your layout and/or featuring photos from a play, seeing a play or a movie. When I was in New York of course I had to see one of the musicals that were playing on Broadway. At the time Shrek the Musical was playing at the Broadway Theater, I loved the movies so the choice to see the musical was quickly made. It was one of the best musicals I've ever seen! 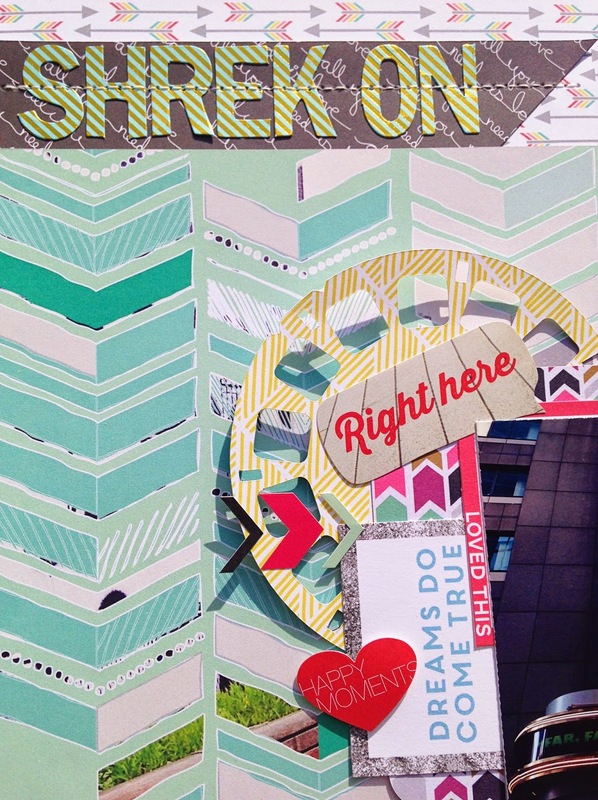 For my layout I used the July kit A Midsummer Nights Dream that was filled with Echo Park Paper Capture Life, Crate Paper Open Road and Pinkfresh Studio. Thanks for stopping by and enjoy our blog hop! Your next stop is Alisha. OOOO Love this layout Danielle!!! Love the layers and placement of the title!! 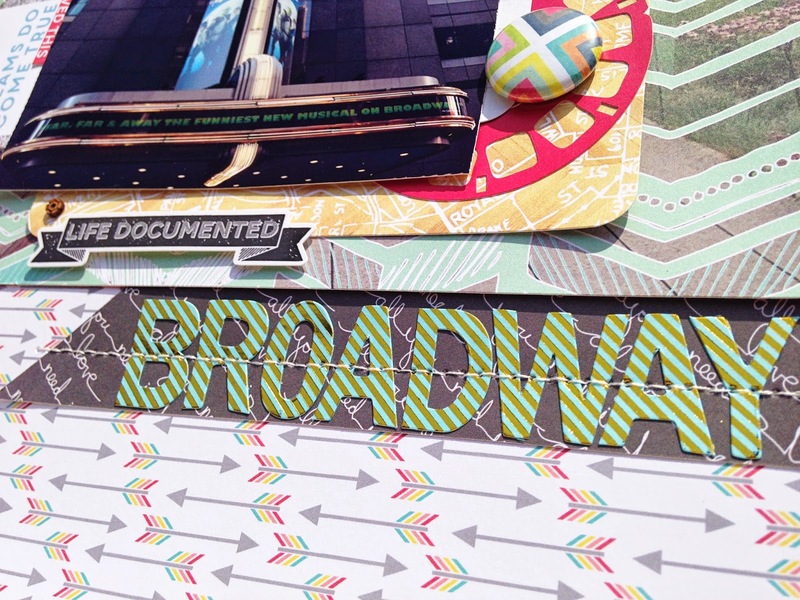 The photo is GREAT and coordinates with these papers nicely! Awesome layout! Danielle, this layout is fantastic! I really love your pops of reds and pinks - they really stand out against the blues and grays but everything works so well together! Fabulous! Great layout and it went perfectly with this months theme. Danielle, you are so awesome!! I adore your style!!! And this one is top notch, as always!! Hey Danielle! Totally loving your layout!! You're really making me want to fix my sewing machine! Love that stitching over those letters! (they are my fav thing about this kit!) Shrek on Broadway would have been very cool to see! Great Layout! I didn't know Shrek was made into a Broadway Show. LOVE the look of the stitching on those letters! Perfect subject for this challenge. Very creative layout. 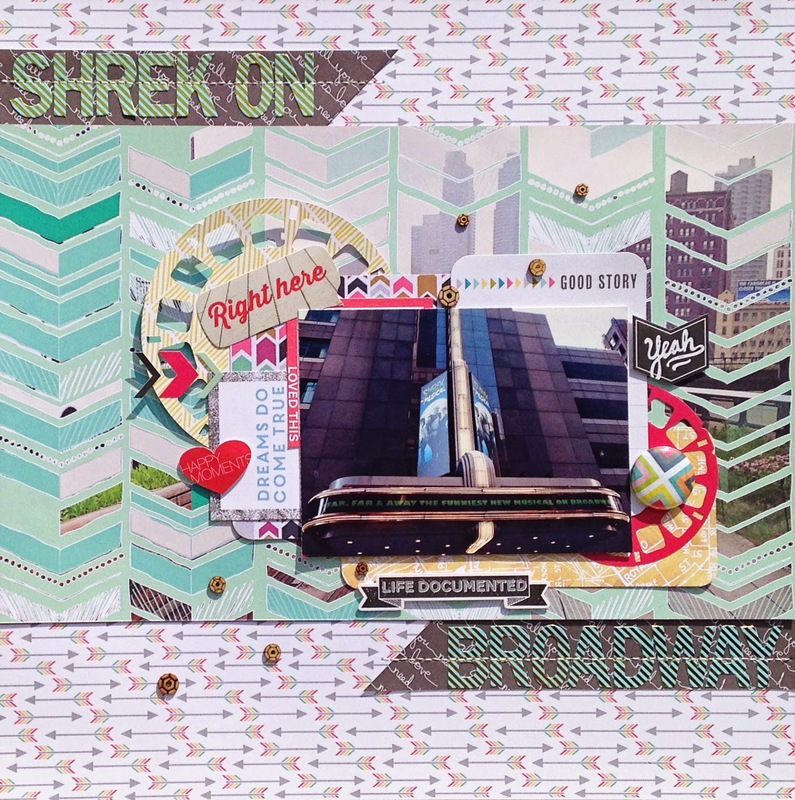 Danielle I love how your layout incorporates the cityscape and the "on film' theme for the challenge perfectly while stilling being perfectly "you" in style-we are thrilled each and every time we see you are sharing your work with your Clique Kit -awesome job! Awesome layout Danielle! Love the mix of those EP papers!! anther great pattern combo. i was at a loss on how to use that paper. Beautiful layout!!! I love the stitching. Love the stitching on the letters and being on the banners really makes them pop! !